What is SEO? - Just the Facts You Need to Know Right Now! Why and How you can use SEO to grow your business. By the end of this post, you will know enough about SEO to start asking the right questions of your marketing team and partners about how you can use SEO as a part of your marketing mix to get in front of more prospects looking for solutions online. The key thing to remember is that, like anything worth doing, good SEO takes time. It also takes commitment to focus on building a technically sound website and creating content of value to your audience. SEO is short for Search Engine Optimisation. SEO is simply the process of affecting a websites' visibility in search engine's organic search results. Researching alternative solutions to their problems. Despite all of the complexity, the talk of Google Penalties and Algorithm updates, at the end of the day SEO basically means anything that will help you improve the visibility of the pages of your website when someone goes looking for something in a search engine. Why is page 1 of Google so important to people? If you have been doing any reading online about SEO, then you know that everyone seems to want to rank on page 1 of Google for specific keywords. But why is it important to be on page 1 for a keyword? And when they look at the search results in Google, they will click on the link to your website and ultimately buy something from you. That's the process in a very simple nutshell. Being is on Page 1 is important because studies have shown that most people only click on websites on the first page of the search results. 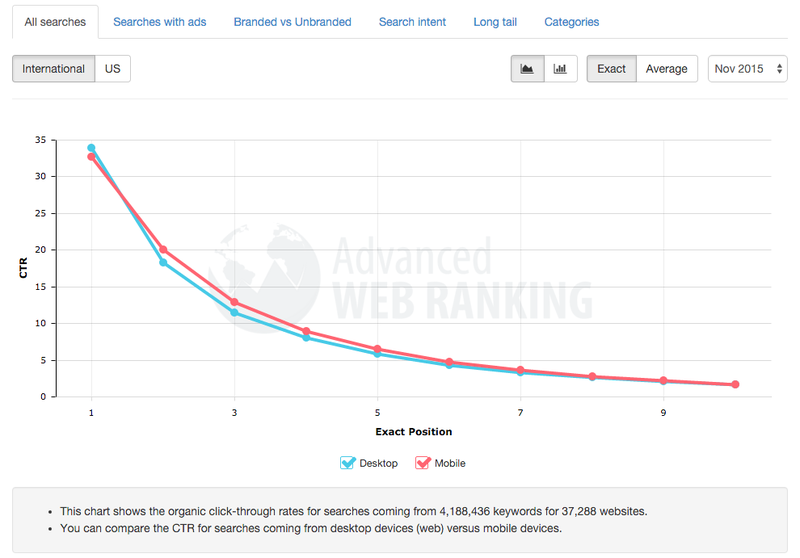 Furthermore, data shows that the website in position 1 gets the majority of the clicks. The most recent study of Click Through Rates at various ranking positions conducted by Advanced Web Ranking in July of 2014 found that on average, a website with a #1 ranking on the first page of Google can expect to get 33.86% of the visitors searching to actually click through to the site. This means a search phrase with 1000 monthly searches will send almost 339 visitors to the website in position #1 in that month. You can download the full study here or analyse the results using their free Google Click-Through Rate tool. 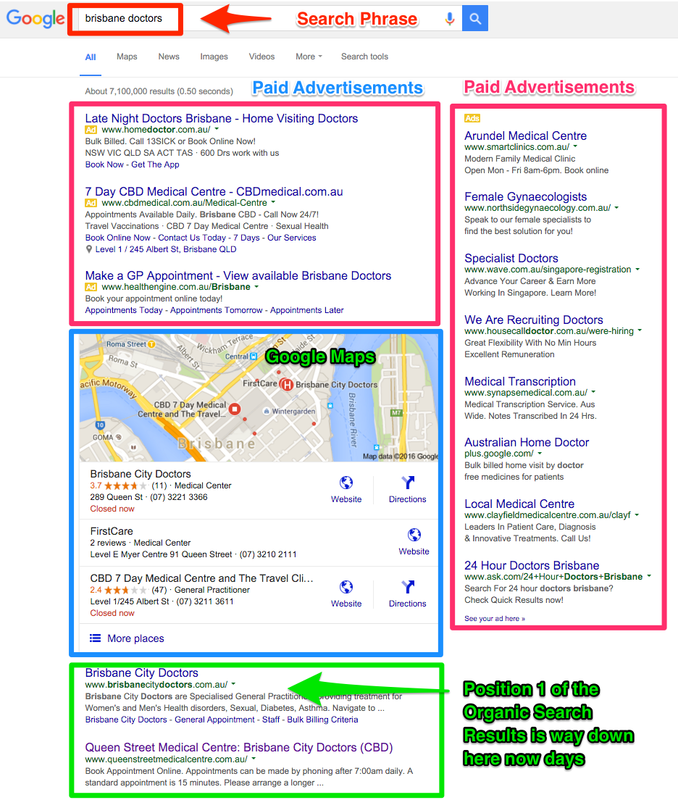 It's important to remember that being ranked #1 in the organic search results is becoming less and less effective as a high traffic generator, as Google's own paid ads, image, maps and video results push the organic rankings further down the page. Once someone discovers that high rankings for specific keyword searches can be valuable the first question they inevitably ask is. As if by knowing this, they will have the path to instant rankings. Google ranks website using a complicated algorithm which takes into account over 200 different variables. If you want to learn more check out the MOZ Search Engine Rankings Factors Study 2015 or check out their infographic below. What's critical to see in this chart is that the #1 ranking factor that all of the experts agreed upon was Domain level features. That is the site as a whole, not just pages. The total sites number of links, domain trust and domain authority. Domain authority is kind of like real world authority. If enough people vouch for you as an expert (whether as an individual or as a business) then you gain authority in that area. If people talk about you when they talk about a topic or an issue, you become an authority in that area. In the same way, websites become more authoritative when more (quality, authoritative) websites link to them. However with today's Google, spammy, low quality, manufactured links won't cut it. Google wants to see real, freely given links to your site, linking to content of value. Oh, and if you get links from other high authority sites, then that is even better. You can be a person of Authority that no one trusts. Just look at the head of any Crime Syndicate! They have authority but no one trusts them at all. When ranking websites, Google wants to rank sites that are the best answer to the question someone posted into Google. So not only does it want to rank Authoritative sites, it wants to rank the most Trusted sites. By including trust, it allows Google to start to devalue sites that are manipulating their authority to try to get high rankings. How is Website Trust Measured? Google has not come out and publically stated how they measure a website's trust. 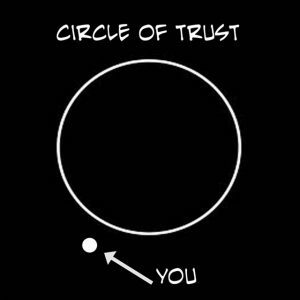 But if you look at how trust works in the real world you can start to see how they might achieve this online. Studies of Trust talk about a concept called Transitivity. This basically means in situations where A trusts B and B trusts C, transitivity concerns the extent to which A trusts C.
In the real world, if I trust my friend who trusts his lawyer, then by virtue of his trust, I, in turn trust the lawyer. Online this means that a site that is "trusted" links to another site, then by implication it is trustworthy. Some online tool providers have attempted to replicate this measurement of trust and have developed metrics to measure the trust of a website. A popular one is the Trust Flow metric from Majestic.com, an SEO tool provider. Trust Flow, a trademark of Majestic, is a score based on quality, on a scale between 0-100. Majestic collated many trusted seed sites based on a manual review of the web. This process forms the foundation of Majestic Trust Flow. Sites closely linked to a trusted seed site can see higher scores, whereas sites that may have some questionable links would see a much lower score. So basically, they manually created a seed list of really trusted sites and then watched how they linked to other sites, and in the process passed on their trust to them. If you want to learn more aboutMajestic's Citation Flow (Authority) and Trust Flow (Trust) metrics then watch this video. Relevance refers to all of those things that you can do to improve the signals that you send to search engines like Google, to help them understand the topic of your website's pages and your domain. This includes both onsite elements, that is the things you can do to your pages as well as offsite elements, such as the topical relevance of the links pointing to your site, and understanding searchers intent and making sure you have a relevant answer on your website. Keywords in the anchor text used to link to you. This is small doses can help. Remember excessive manipulation of the anchor text in links is a spam signal as well so be careful. Where does SEO fit in the whole online marketing picture? Not all online businesses need SEO. Some businesses have a product that lends itself to a direct marketing approach that can be well served with paid advertising such as Google Adwords and Facebook Ads. If however, you have a product or service where your prospects typically find you by searching for information on search engines, then SEO is perfectly suited to being a part of your long-term strategy. It's important to remember that SEO is a long-term activity, one that you need to embed in your ongoing processes. It is not like a marketing campaign that generates traffic when you start paying money and stops when the budget is finished. I like to think of SEO as the foundation layer that you build all of your online marketing activities. Your optimised website is the ideal place to host paid landing pages, which can be optimised to function as great search engine traffic landing pages. When you decide that you want to incorporate SEO into your online marketing there is a standard process that you should follow. Having a logical site structure with unique pages for each product, service or topic you are writing about so that people and search engines can easily find what they are looking for. Having a well-optimised website where the pages are optimised to rank and get found for the most relevant keyword phrases. Having unique, comprehensive website copy that is the best answer for prospects who go to a search engine with a specific question or problem in mind. This means no copied content that you can find on any other website. Having links from authoritative, trusted and relevant websites so that Google can better assess the worthiness of your pages and site to rank high in the search results. The process that you follow, whether you use the Seo services of an SEO agency or you learn to do SEO yourself is essentially the same. Promote your site to attract authoritative, trusted relevant links which will help your pages improve their rankings in the search engines. As long as there are people looking for information online, search engines will have a role to play. If there is one aspect of the development of search engines you should understand that will help you in all of your future activities it is the concept of Semantic Search. Semantic search simply means that search engines are moving to a place where they can understand he meaning of your searches. That is they understand both the words and the context of the search. "Movie about a time travelling phone booth"
If you look at that search result you will notice that nowhere in any of the results do the keywords "Movie about a time travelling phone booth" appear. There are many great online resources you can go to to learn more about SEO. To simplify your selection, I'm going to advise you to visit The Beginners Guide to SEO from MOZ. So, do you have any questions? If so please leave them in the comments below.